Tufts of paper erode under rows of champagne glasses, yellowing the cloth that has been pinned under wooden table edges with Victorian sterling silver clasps. The glasses tremble slightly as engines throttle on cresting tides. The bay is choked with yachts, each displaying a nimbus of celebrity. From the decks comes a racket of Italian and French muttering, their orchestration contributing to the drama of the French Riviera. Covering seventy-five miles between Saint-Tropez and the Italian border, the Riviera is the velvet rope that ties together glamorous titles, pulling them to a lasting up-beatitude. The sea retreat has spoiled the poster children of Hollywood and olive-skinned models of Eastern Europe, hyperactive financiers of status and photographers of ambition, becoming nothing more than an elitist playground to spoil away their days. Many notables share a common mannerism inside glazed restaurants and identical strides within marbled palaces. But soon they take refuge along ribbons of golden sand, running down the Mediterranean shoreline like runway strips, pebbled with stones, some as tiny as pearls, others as large as their de rigeur Ferrari’s stick shift. For as long as anyone can remember, it was starlet Bridgette Bardot that transformed the image of Saint-Tropez with her arrival in 1956 for the shoot, And God Created Women. Truthfully, it was French neo-impressionist Paul Signac who surfaced, breathing easily, in Saint-Tropez. Signac stretched his arms out to his friends, among them fellow French painter Henri Matisse. Provoked by pleasant light falling on serene landscapes, they painted and paved way for new works illuminated with dissonant colors unfamiliar to their subjects. In recent years Saint-Tropez adopted a less colourful identity: “St. Trop”, in French meaning “too much”—an unfavourable contrast between ripened beauties drowned in self-destruction to aging starlets stitched with plastic. In the summer months, the population triples, and as an escape from the hubbub, nearby vineyards act as a safe refuge. The atmosphere is duplicated in Cannes during the International Film Festival. The apex of resort towns, Cannes, breeds wealthy clouts, yuppies and wasps, relying on “wasta”- the Lebanese term for connections. They bring their demands, their hissing, to the Promenade de la Croisette, dressed with palm trees and elegant flowers. At the end of the boulevard, near moored pleasure boats and gliding water skiers, emerges a new chapter in glamour: Casinos filled with loyal customers, promising instant gains. Thousands of roses nod toward the sun; their beds spread across Parc de la Roseraie nearby. Tiny squares also bathe in the sun, shadowing 18th century homes overlooking the old port awaiting self-conscious crowds. Pablo Picasso periodically escaped to a nearby town of Vallauris, spurring a resurgence of activity when he settled there in 1947. His whimsical ceramic pieces parallel the beauty of the tunnel-like medieval chapel of the former priory he decorated, titling the fresco, War and Peace. He traveled east to the crumbling old Greek port of Antibes, banqueted with fishing and rose trading, before burying himself in The Château Grimaldi. Inside the 12th century old villa, many of his paintings, pottery, and lithographs inspired by sea and Greek mythology are safeguarded. 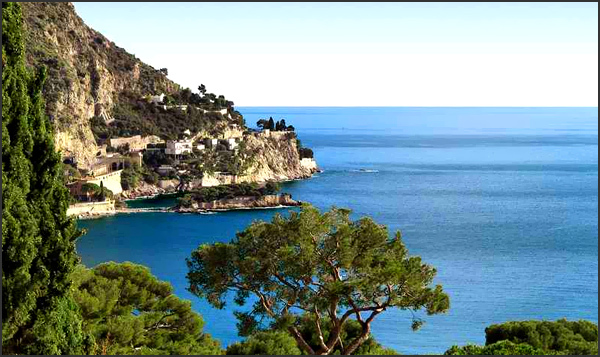 The Cap d’Antibes peninsula is kissed with rich deposits of vegetation spread two miles wide. From most of the available surface at Pointe Bacon, a striking view of Baie de Angeles (Bay of Angels) advances toward the city of Nice. Cushioned atop Plateau de la Garoupe, among frescoed vistas, fortified medieval towns perch on mountaintops similar to those discovered in the Italian province of Tuscany. One such town is Grasse, populated with rose and lavender fields, which supply a local fragrance factory that fills most of the nation’s high-retailed perfume bottles. Painters Matisse and Pierre-Auguste Renoir captured endless hours of sunrays burning over the pregnant fields, translating its shading on canvas. Grasse had been a leather-producing town but as soon as people demanded scented leather products, the city began cultivating flowers and distilling essences. Miraculously the small town supplies three-fourths of the world’s essences, from wild lavender and jasmine, violets and daffodils, found in perfumeries as near as Paris and as far as Damascus. Another medieval hill town roasting on a rocky spur, past a few deep gorges, is a town called Eze. Beyond the 14th century gate, craftsmen stubbornly direct its cobbled streets decorated with vaulted passageways and stairs, spreading their scented soap and intricate crafts for sale. 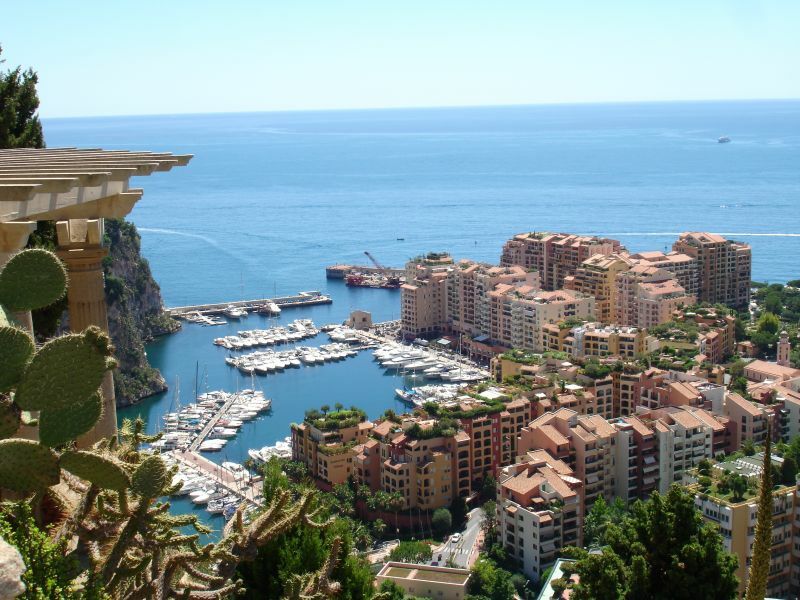 A short escape from the throbbing headache of the art scene, is the exciting Principality of Monaco covering as many acres as New York City’s Central Park. 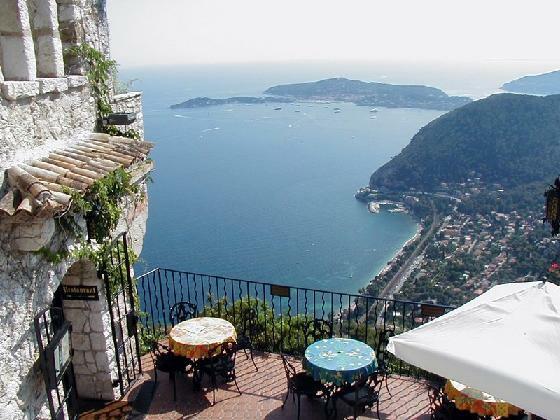 It was here that Sovereign Prince of Monaco, Albert II, claimed the thrown after his father’s death a few years ago. Monaco is also the golden seat of annual Grand Prix, a Formula One Race held to its highest prestige among automobile races across the world. Monaco hovers its administration and upon Monte Carlo, swimming lightly in gold-leaf splendor to impress the gamble hidden inside gilt-edged rococo buildings. Gambling is king in this city, with Reno, Macau, and Atlantic City serving as palace maids. The main gambling hall of Le Grand Casino, formerly known as the European Room has been renamed the American Room, is dusted with public figures worth more than most developing economies. They flood the coastline with their creamed yachts, stomping their way into the city, like the fleet of Emperor Julius Caesar. The Riviera strangely draws you in, hinting at of all sorts of hedonistic pastimes. Although the popular tourist destination offers marvelous terms, visiting is a gamble.